More than 500,000 copies downloaded worldwide! Compared to Silence of the Lambs and Criminal Minds by many readers, this gripping psychological thriller follows rookie FBI profiler Brandon Fisher as he takes on his first murder investigation. When the hunt takes a dark and personal turn, though, Brandon’s new career just might cost him his life. “Riveting and disturbing” (Chanticleer Book Reviews), Eleven will have you panting for breath and sleeping with the lights on. Join the 2600-plus readers who have rated Eleven on Goodreads and plunge into a series that will take you into the minds of the most heinous and disturbing serial killers the world has ever seen. Eleven Rooms. Ten Bodies. One Empty Grave. When Brandon Fisher joined the FBI Behavioral Analysis Unit, he knew he’d come up against psychopaths, sociopaths, pathological liars, and more. 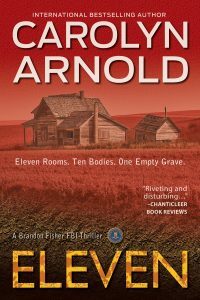 But when his first case takes him and the team to Salt Lick, Kentucky, to hunt down a ritualistic serial killer, he learns what nightmares are truly made of. Beneath a residential property, local law enforcement discovered an underground bunker with circular graves that house the remains of ten victims. But that’s not all: there’s an empty eleventh grave, just waiting for a corpse. The killing clearly hasn’t come to an end yet, and with the property owner already behind bars, Brandon is certain there’s an apprentice who roams free. As the FBI follows the evidence across the United States, Brandon starts to struggle with the deranged nature of his job description. And if the case itself isn’t going to be enough to push Brandon over the edge, he’s working in the shadow of Supervisory Special Agent Jack Harper, who expects nothing short of perfection from his team. To make matters even worse, it seems Brandon has become the target of a psychotic serial killer who wants to make him—or his wife—victim number eleven. She currently lives in London, Ontario, with her husband and beagle and is a member of Crime Writers of Canada and Sisters in Crime.